Einstein, meanwhile, had taken up with a divorced cousin, Elsa, who jovially cooked and cared for him during the emotionally draining months when he made the intellectual leaps that finally resulted in general relativity. Unlike Mileva, she gave him personal space, and not just for science. As he became more widely known, ladies swarmed around him like moonlets circling a planet. These dalliances irritated Elsa, who eventually became his wife, but as she told a friend, a genius of her husband's kind could never be irreproachable in every respect. Cavalier as he may have been about his wives, he had a deep moral sense. At the height of World War I, he risked the Kaiser's wrath by signing an antiwar petition, one of only four scientists in Germany to do so. Yet, paradoxically, he helped develop a gyrocompass for U-boats. During the troubled 1920s, when Jews were being singled out by Hitler's rising Nazi Party as the cause of Germany's defeat and economic woes, Einstein and his "Jewish physics" were a favorite target. Nazis, however, weren't his only foes. For Stalinists, relativity represented rampant capitalist individualism; for some churchmen, it meant ungodly atheism, even though Einstein, who had an impersonal Spinozan view of God, often spoke about trying to understand how the Lord (der Alte, or the Old Man) shaped the universe. In response to Germany's growing anti-Semitism, he became a passionate Zionist, yet he also expressed concern about the rights of Arabs in any Jewish state. Forced to quit Germany when the Nazis came to power, Einstein accepted an appointment at the new Institute for Advanced Study in Princeton, N.J., a scholarly retreat largely created around him. (Asked what he thought he should be paid, Einstein, a financial innocent, suggested $3,000 a year. The hardheaded Elsa got that upped to $16,000.) Though occupied with his lonely struggle to unify gravity and electromagnetism in a single mathematical framework, he watched Germany's saber rattling with alarm. Despite his earlier pacifism, he spoke in favor of military action against Hitler. Without fanfare, he helped scores of Jewish refugees get into an unwelcoming U.S., including a young photographer named Philippe Halsman, who would take the most famous picture of him (reproduced on the cover of this issue). Alerted by the emigre Hungarian scientist Leo Szilard to the possibility that the Germans might build an atom bomb, he wrote F.D.R. of the danger, even though he knew little about recent developments in nuclear physics. When Szilard told Einstein about chain reactions, he was astonished: "I never thought about that at all," he said. Later, when he learned of the destruction of Hiroshima and Nagasaki, he uttered a pained sigh. Following World War II, Einstein became even more outspoken. Besides campaigning for a ban on nuclear weaponry, he denounced McCarthyism and pleaded for an end to bigotry and racism. 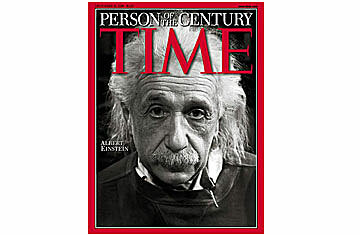 Coming as they did at the height of the cold war, the haloed professor's pronouncements seemed well meaning if naive; Life magazine listed Einstein as one of this country's 50 prominent "dupes and fellow travelers." Says Cassidy: "He had a straight moral sense that others could not always see, even other moral people." Harvard physicist and historian Gerald Holton adds, "If Einstein's ideas are really naive, the world is really in pretty bad shape." Rather it seems to him that Einstein's humane and democratic instincts are "an ideal political model for the 21st century," embodying the very best of this century as well as our highest hopes for the next. What more could we ask of a man to personify the past 100 years? See how Einstein spent his Nobel Prize money.